July 31, 2010 by rwb, under Microcontroller. The rapid penetration of the internet networks into many of today’s modern homes and personal gadgets (e.g. smart phone and smart pads) opening a tremendous useful and interesting embedded system application that could be integrated into our house or known as the intelligent house. For example by putting a small embedded system web server in our house, we could easily monitor such as alarm, temperature or even turn on/off the lamp or the garden’s water sprinkle; eventually from any remote location through the wireless personal gadget; Or perhaps you just want to impress your relative or friend with a very accurate digital clock which automatically synchronized the time through the Network Time Protocol (NTP) over the internet at your home or office. All of these interesting and challenging embedded system applications could be accomplished by integrating the Ethernet protocol which is formed the basic of the communication protocol used in the internet into the embedded system. Currently there are several approaches for this solution but basically they could be divided into two categories wired e.g. 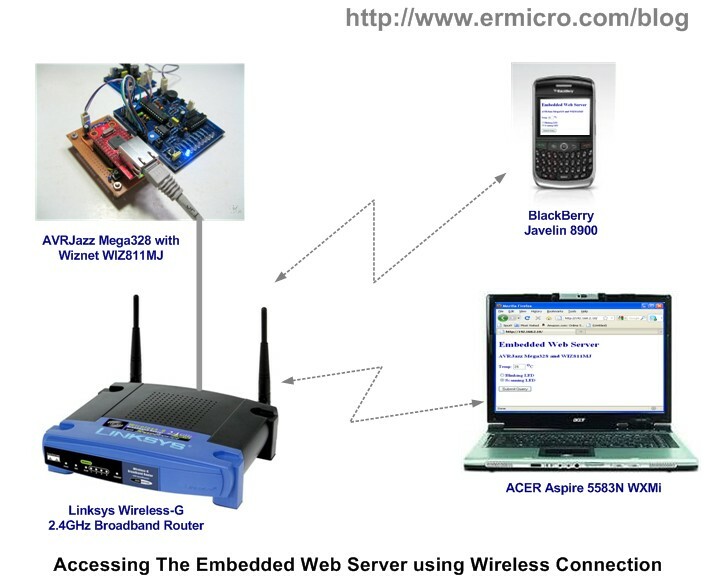 Wiznet W5100, W5300, Microchip ENC28J60 and wireless such as the Microchip ZG2100MC Wi-Fi module (recently is acquired by Microchip from the Zero-G Wireless on Jan 11, 2010). 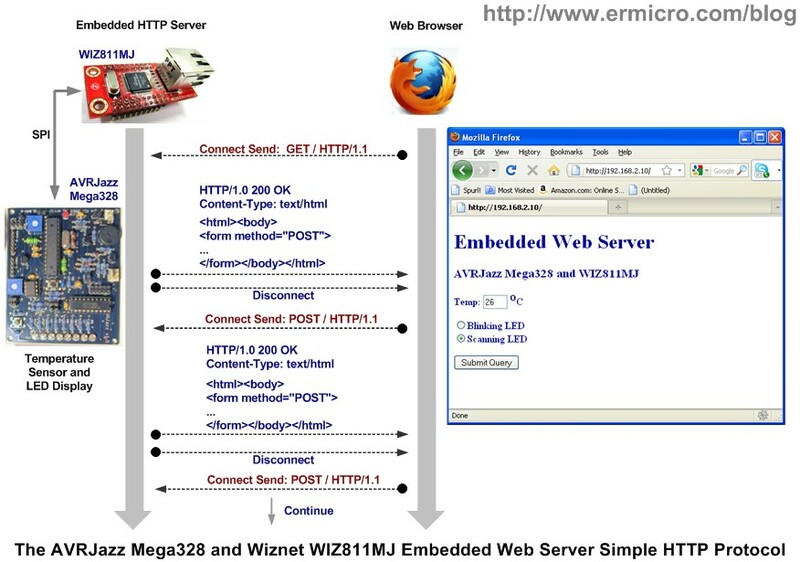 On this tutorial we are going to build the embedded web server using the Wiznet WIZ811MJ network module which is based on the Wiznet well known W5100 TCP/IP hardwired chip that include the ethernet controller physical layer (PHY). 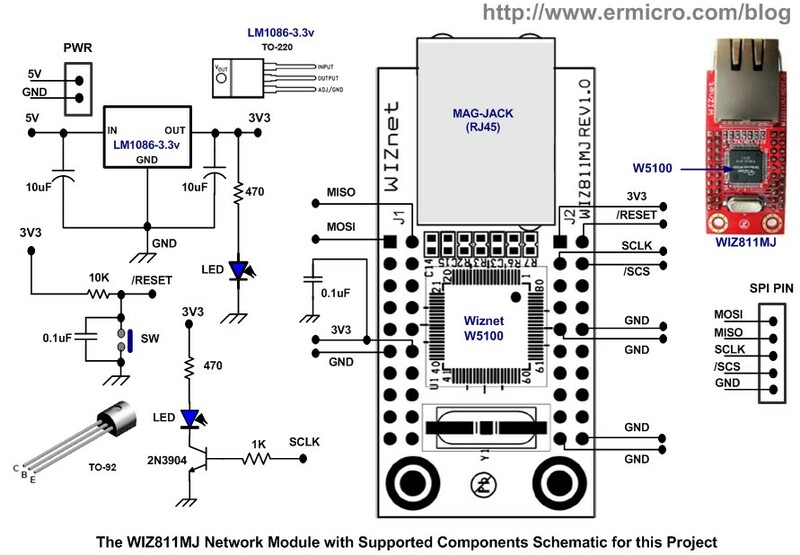 The WIZ811MJ network module comes with the Wiznet W5100 chip, MAG-JACK (RJ45) together with the glued logic needed to communicate with the microcontroller through the SPI or bus interface. 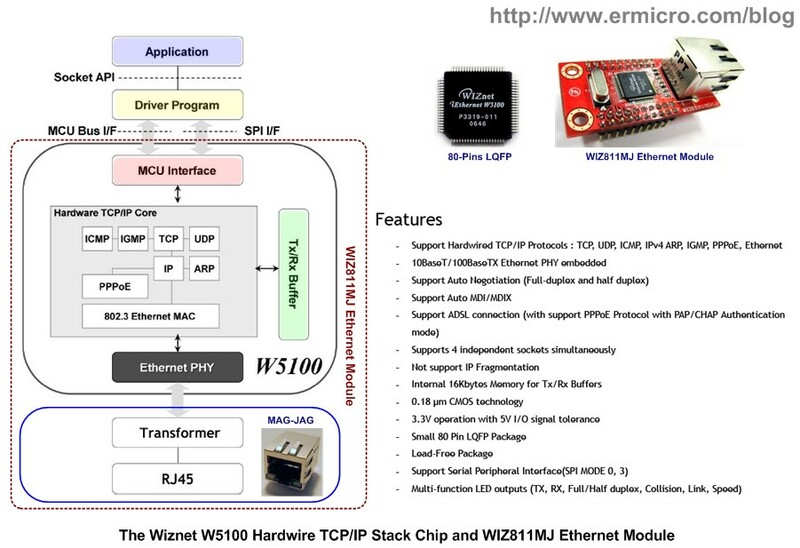 The reason I choose the Wiznet 5100 based chip on this tutorial because this chip has the TCP/IP hardwired on it; therefore it will make developing the TCP/IP protocol stack based application much easier and could be implemented on the small RAM size microcontroller class compared to the firmware TCP/IP protocols stack based implementation approach (you don’t have to know everything about the TCP/IP protocol stack in order to be able to use this chip). The other reason is because the Wiznet 5100 chip has been around for a few years in the market and has already being matured. This chip is used in many commercial applications such as the Arduino framework on their standard Arduino Ethernet shield as shown on this following picture. Reference Document: W5100 Datasheet, WIZ811MJ Datasheet, W5100 Porting Guide, Atmel AVR ATMega328 Datasheet. Basically the Wiznet W5100 implements a full-featured of standard IEEE 802.3 (Ethernet physical and data link layer) and powerful TCP/IP stack inside the chip; this make the Wiznet W5100 chip is suitable choice for integrating the embedded system into the internet. 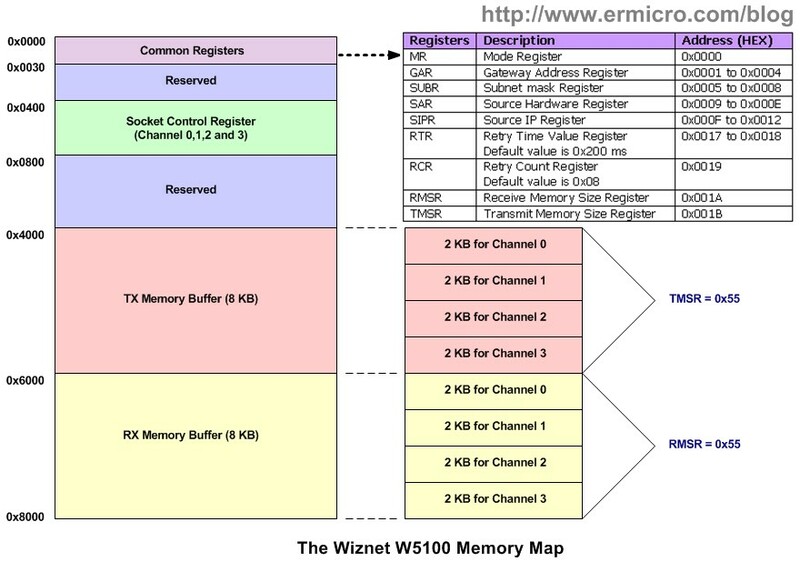 Programming the Wiznet W5100 chip is also easier as we just need to write and read to and from the W5100 internal registers in order to use the build-in TCP/IP protocol features. The Wiznet W5100 chip come with three method of controlling its internal registers; this first two is to use the parallel direct or indirect bus, the last one is to use a well known embedded serial data transfer known as the SPI (serial peripheral interface), on this tutorial we are going to use the SPI to control the Wiznet W5100 chip. You could read more about SPI on my previous posted blog Using Serial Peripheral Interface (SPI) Master and Slave with Atmel AVR Microcontroller. 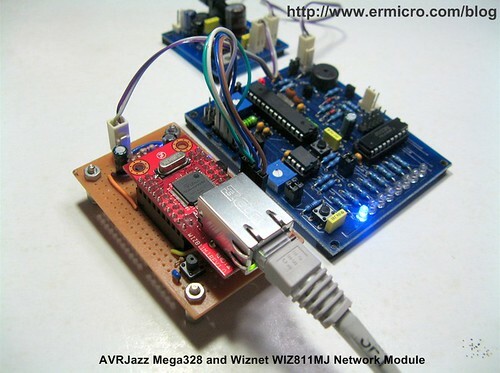 The basic SPI connection between the Wiznet WIZ811MJ network module and Atmel AVR ATMega328 microcontroller is shown on this following picture. The Wiznet W5100 will act as the SPI slave device controlled by Atmel AVR ATMega328 microcontroller as the SPI Master. The SPI protocol need at least four signal i.e. MOSI (Master Out Serial In), MISO (Master In Serial Out), SCK (signal clock provided by the master) and CS (the SPI slave chip select). 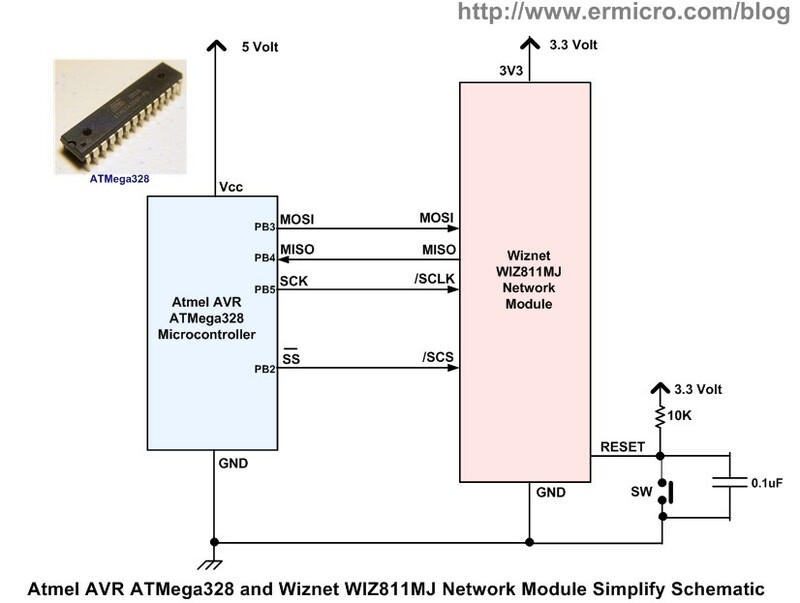 Although the AVR ATMega328 microcontroller support all the SPI modes (i.e. 0,1,2 and 3) but the Wiznet W5100 chip support the most SPI common modes (mode 0 and mode 3) where it will sample a data on rising edge clock and outputting on the falling edge clock. The W5100 chip also provides the interrupt pin, but on this tutorial we don’t use the interrupt feature, instead we use a pooling method to control the W5100 operation. In order to understand of how we control the Wiznet W5100 as the SPI slave device, we are going to create the W5100 initialization program; so it will response to the simple “ping” network command (ICMP protocol). 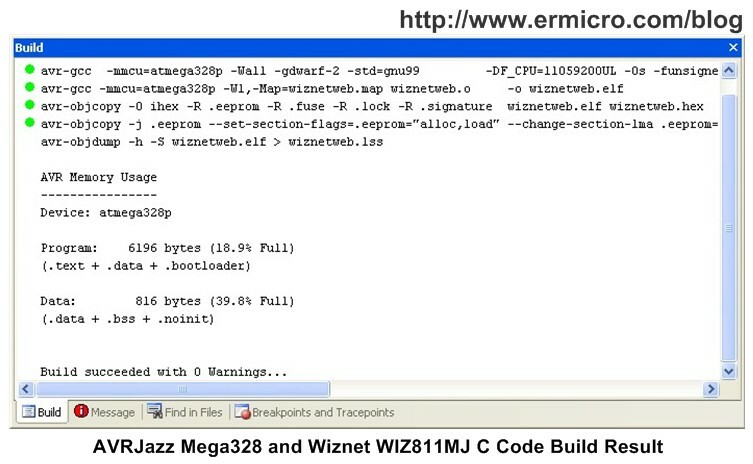 The following is the complete C code called “wiznetping.c” for initializing the Wiznet W5100 chip. After compiling and downloading the HEX program into the AVRJazz Mega328 board; connect the RJ45 connector UTP ethernet cable to your hubs/switch or you could connect directly with the cross configuration cable to your computer. Use the serial terminal such as Hyperterminal, puTTY or Tera Term and configure it to accept the serial connection with 19200 baud rate, 8-bit data with No Parity Check. To initialize the W5100 chip, we need to write on each of the W5100 common registers named MR (Mode Register), SUBR (Subnet mask Register), SAR (Source Hardware Register), SIPR (Source IP Register), RMSR (Receive Memory Size Register) and TMSR (Transmit Memory Size Register). 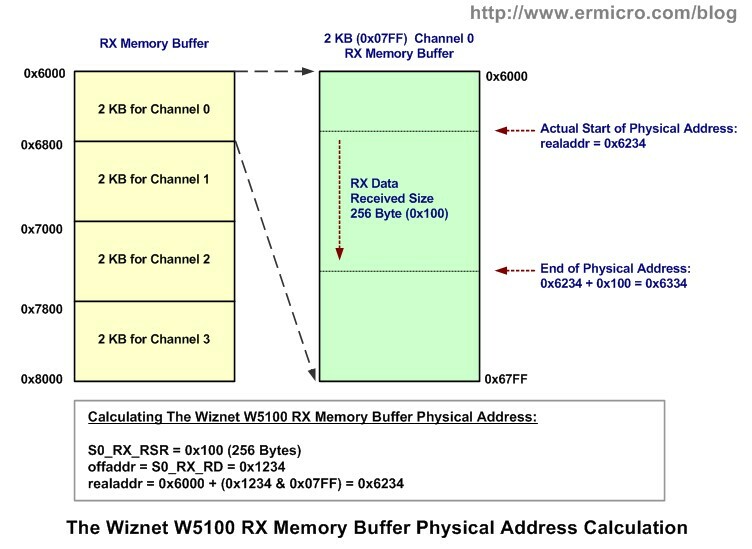 All the Wiznet W5100 registers address has 16-bits wide and the register it self is 8-bits wide; because we use 8-bit AVR ATMega328 microcontroller SPI, therefore in order to perform write or read operation we need to pass the first 8-bit MSB (most significant byte) and follow by the 8-bit LSB (least significant byte) of the W5100 register address. The Wiznet W5100 also use two operant commands to differentiate between the WRITE (0xF0) and READ (0x0F) operation. 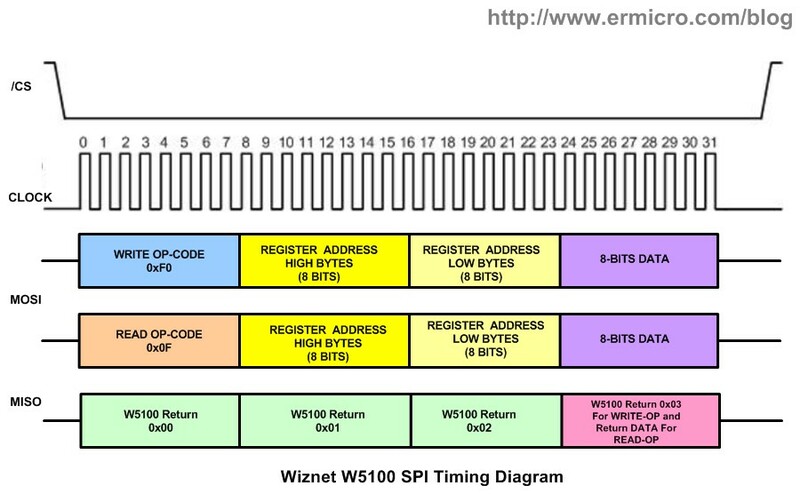 The Wiznet W5100 SPI write and read routine is implemented in the SPI_Write() and SPI_Read() functions on the above C code. 00-04-A3   (hex)      Microchip Technology, Inc.
0004A3     (base 16)  Microchip Technology, Inc.
Now the question is how you could get your own MAC address because the Wiznet W5100 chip is shipped without its own MAC address; the answer is you could either register your own MAC address (OUI) to IEEE (of course this is not recommended for the hobbyist as this will be very expensive unless you could effort it) or you could simply use your own computer NIC’s MAC address and just change the last byte of the 6 byte MAC address and cross you finger, hopping this MAC address will be unique within your network as I did. By using the “ipconfig /all” command in the window command prompt, you could get the information of your computer MAC address in hex notation i.e. 00-16-36-DE-58-F5 (the MAC address of my computer); now by adding one to the last byte you will get the W5100 MAC address that I used in this tutorial (00-16-36-DE-58-F6). 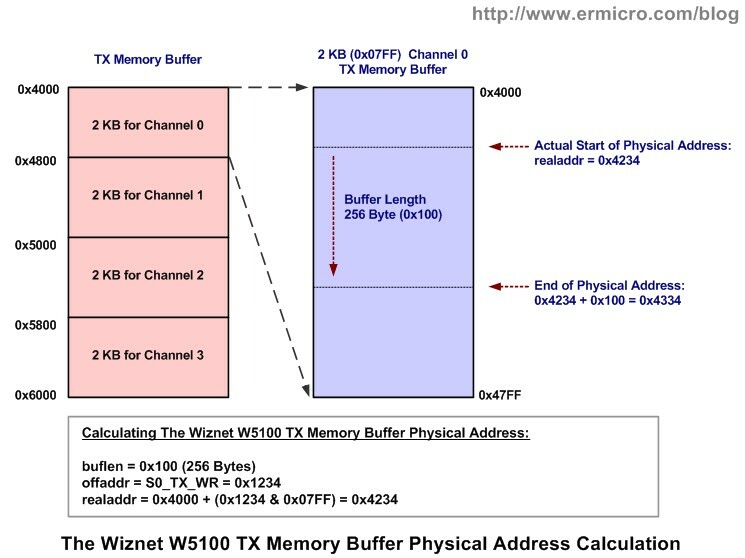 The last is to allocate the transmit and receive buffer size to each of RMSR (RX Memory Size Register) address: 0x001A and TMSR (TX Memory Size Register) on address 0x001B. 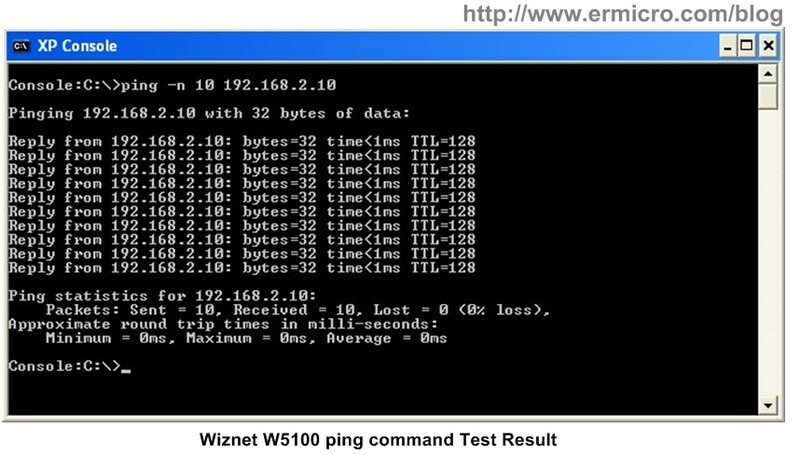 After performing all the W5100 required initialization routine you could examine whether it work or not by sending the “ping” command to the W5100 build in ICMP (Internet Control Message Protocol) package responder. If everything works, then you will get the ICMP reply from the Wiznet W5100 chip. With this understanding now we are ready to continue this tutorial and make our first simple embedded web server. The advantage of using the Hypertext Transfer Protocol (HTTP) server in the embedded system is; you don’t have to develop a special client application to communicate with your embedded system. All you need is to use any standard browser that comes with your personal computer operating system or gadget to talk to your embedded system. The HTTP server uses a simple text called Hypertext Markup Language (HTML) to interact with the browser (client application) through the TCP/IP protocol. The client then will translate this received HTML text and display the information on the browser screen such as room’s temperature and the output LED status. By submitting different LED setting from the browser (POST request) to the HTTP server, now we could easily give the needed instruction to the AVR ATMega328 microcontroller that also functioned as the embedded web server. From the C code above you’ve noticed that I used many of the Atmel AVR ATMega328 microcontroller build in peripherals features such as SPI, ADC, TIMER and the UART at the same time in order to achieve the project’s goal, you could read more information of how to use all of these peripherals on my previous posted blog Analog to Digital Converter AVR C Programming and Working with AVR microcontroller Communication Port Project. To build the HTTP server we need to listen for the client request, read the client request and send the HTML response to the client through the TCP/IP protocol. 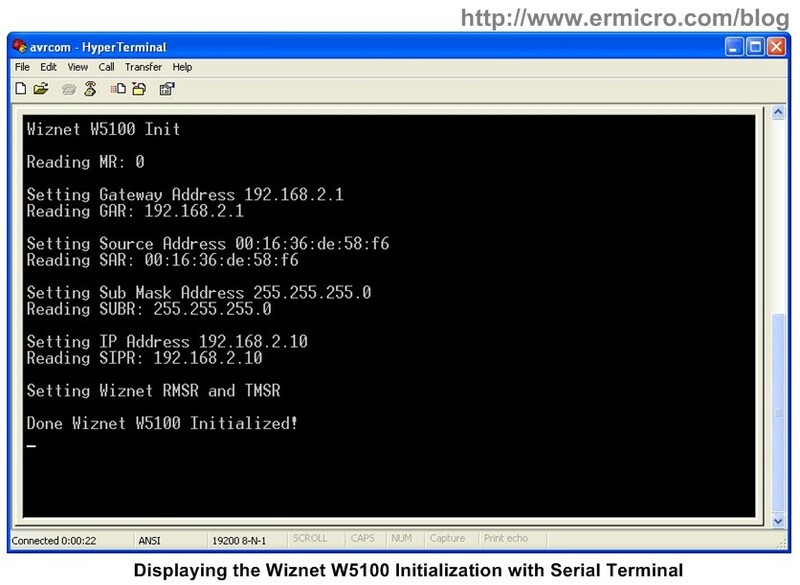 To configure and control the Wiznet W5100 as the HTTP server basically we need to write and read to and from the Wiznet W5100 Socket Control Register and the TX and RX buffer memory; for the purpose of this tutorial (easier to understand) I only implement one channel (socket 0) of the four available channels (socket 0, 1, 2 and 3) supported by the W5100 chip. But once you understand the basic principal of how the W5100 work on this tutorial it would be easy to implement the remaining channels. 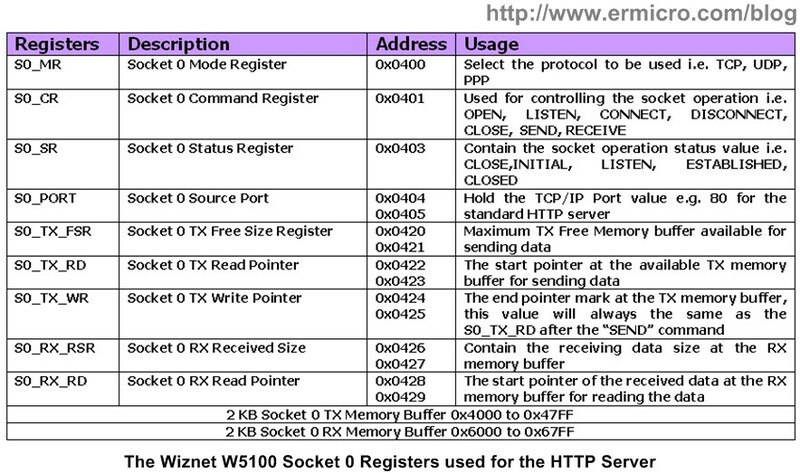 The Wiznet W5100 socket 0 control registers start at address 0x0400 to 0x04FF, the following is the list of W5100 socket 0 control registers with the 2 KB of TX and RX memory buffer used to make the HTTP server in this tutorial (again please refer to the W5100 datasheet for detail information). Now fasten your seat belt as we are going through the code algorithm behind this W5100 HTTP server program! After we wrote the CR_OPEN (0x01) command on the socket 0 command register (S0_CR), then the W5100 will automatically clear this register; therefore we could take advantage of this behavior by reading this register again and examine its contents. Upon completion of the command execution process the contents of the SO_CR register will be reset to 0x00 and the socket 0 status register (S0_SR) will be set to the SOCK_INIT (0x13) status. Listening to the opening TCP/IP port (i.e. 80) could be done by sending the CR_LISTEN (0x02) command to the socket 0 command register (S0_CR), this will change the socket 0 status register (S0_SR) to the SOCK_LISTEN (0x14) status. The listening routine is implemented in the listen() function. Now the Wiznet W5100 is ready to receive the request from client (browser). If the received data exist in the RX buffer memory then we continue to read the RX memory buffer content which is implemented in recv() function. The reading process is accomplished by first calculating the received data physical address location at the 2 KB (2048 or 0x800 in hex notations) RX memory buffer boundary and then start to read the data from this location. The following picture show of how we determine the physical address of the received data. Finally we give the CR_RECV (0x40) to the W5100 socket 0 command register (S0_CR) to complete the W5100 receiving process (updating the RX memory buffer pointer and received data). Next we need to write the CR_SEND (0x20) command to the W5100 socket 0 command register (S0_CR) to instruct the W5100 chip to send the HTML response data in the TX memory buffer. Next the infinite loop routine in main program will start opening and listening to the new client request and the whole process is repeated again. Before executing the for() infinite loop, first we initialized all the needed peripherals such as PORTD for displaying LED, UART for debugging, ADC for reading temperature sensor, SPI for communicating with the Wiznet W5100 chip and last TIMER0 for ADC conversion and controlling the LED display. The HTTP server protocol handshaking is implemented inside the infinite loop and I use the AVR ATMega328 microcontroller TIMER0 to implement the temperature reading through the ADC peripheral and to control the LED display indicator. The AVR ATMega328 TIMER0 peripheral is being set to execute the TIMER0 interrupt routine ISR(TIMER0_OVF_vect) on every 10 ms. Using the tenms counter variable, we reduce down to about 200 ms to make the LED display appear nicely in our eyes and at the same time we do the ADC conversion from the National Semiconductor LM35DZ precision centigrade temperature sensor. You could read more about reading the LM35DZ from my previous posted blog AVR LCD Thermometer Using ADC and PWM Project. You could easily activate the debugging mode by changing the _DEBUG_MODE definition value to 1 before compiling the program and use the serial terminal program to watch the result. 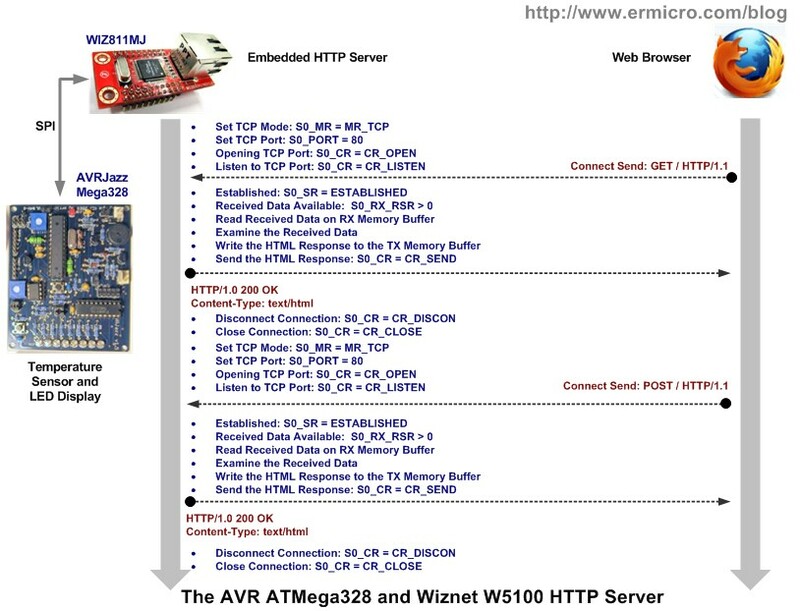 Actually the W5100 socket driver for the Atmel AVR microcontroller families has been provided by the Wiznet (version 1.5, as I published this blog), you could download the driver from their site (http://www.wiznet.co.kr). This driver (version 1.4) is adapted and used in the Arduino framework environment, known as the Arduino Ethernet Shield library. Of course if I use the Wiznet socket driver in this project then you won’t learn anything, therefore to honor the spirit of experimenting inside every electronics hobbyists I decided to write my own version of the Wiznet W5100 socket driver for this project. Hopefully this project will give you a better understanding of how to integrate the Wiznet W5100 TCP/IP hardwire chip in your next embedded system application. Brilliant Article, worked down the the T and can easily be broken into functional .c files. Is this original??? Hope you don’t mind, referencing your article on my blog. The next step I’m going to attempt it to get the AVR to return the contents of a file on SD Card…. any experience with this? Yes this is an original and only could be found here. Most of the ethernet C code out there use the wiznet driver or modified version of it (e.g. Arduino Ethernet Shield Library). I would be glad if you want to referencing this article in your blog. The SD card read/write through SPI (Serial Peripheral Interface) is on my article’s queue list. An excellent article that I found a great help in becoming familiar with the W5100 in TCP mode. Thanks for posting this. 1. User sets one of the radio buttons in the browser then clicks submit. 2. In the main for(;;) loop a transition to SOCK_ESTABLISHED is seen and the received web page is parsed for either “radio=0” or “radio=1”. 3. Occasionally this code is executed before the entire page has been received so neither string is found. 4. The result is that the LED state is not updated and the old state gets reported back to the browser. A rather inelegant fix is to add a delay before capturing the ‘receive size’ to allow sufficient time for the entire page to arrive.. A more elegant solution may be to re-test the ‘receive size’ if no radio button string is found and, if not 0, repeat the recv() and parsing loop. As this is intended as a sort of tutorial perhaps changing the code is not really warranted. Sure you could use the Atmel AVR ATmega640. All the Atmel AVR with SPI peripheral and at least 8K In-System Self-Programmable Flash could be used. I have two ds18x20 sensor that works perfectly, but my program still appears Temp , but I should have it written out Temp , temp  on the Web server. What is wrong in my code? TempData , unsigned int size box. Remember using the “strcpy” command will always overwrite the previous HTML “buf” content with a new value, while using “strcat” command will concatenate or append a new value to the existing HTML “buf” value. Thanks, I completely forgot how it works command strcpy and strcat. 5 units WIZ810J and one PC (Linux server with Apache, PHP and MySQL) in the network. But UDP has the advantage that it allows mutlicast. Server can receive data from multiple client, but the problem is that UDP does not check whether the information was successfully submitted. As TCP checks, but does not allow multicast. On the PC would only transmit the data measurements for the file in mysql database and then review the data. What to me you suggest? Choosing whether to use UDP or TCP is depend on your application. For example when I used microcontroller and WIZ810J to control the turnstile gate connected and verified by database on the PC server I will use TCP because I need to open the turnstile gate when the barcode ticket is verified (reliability). Next when I used the same circuit for broadcasting the room’s temperature and humidity to several computers (PC) connected on the network then I will use UDP (multicast). Hello.. Let me first start by saying that this is a great article. I followed the code as above and when I try to ping my board it get replies only half the time. My connection doesnt seem to be reliable. What should I be looking at? Thanks. What did you mean by half the time? Is it slower? Try to use direct connection (cross cable) between your board and computer, make sure you use a good quality of UTP connectors and cable. I get response for only 2 pings out of 4! I am not sure if its the cable problem or some sort of loose connection. I was using a cross over cable and connecting it directly to my PC. I guess my PC dint like that. I am now connecting the wiznet board to a wireless router and talking to the router wirelessly from my PC. This set up works fine for me now. Thank you for the exceptionally well written and documented guide! I really appreciate the single-file demonstrations, and the diagrams. I’d like to use parts of your code in a gadget that I might sell commercially some day. Can I pay you for a license? It’d be a gesture of thanks and support. In this project we focus on TCP/IP used by the HTTP (Web Server), I will post using the UDP in the future article. Thanks a million, going to port over for w5200 (using wiz820io) and a atm328. lo que pasa es que no me ase el ping. I read W5100 documentation and there only SOCK_CLOSE_WAIT is used for socket closure in TCP IP application. Not sure why you added extra ones but it seems to cause web server resetting connection, at least in my environment. In reference to the UART i need to know how you connect RS232 to the PC beacause, inside firmware list, i don’t find the setting of the PORTA-B-C-or PORTD RX-TX for send data from AVRJazz Mega328 board to the PC via RS232. You could get the ATmega328P microcontroller UART peripheral C command in uart_init(), uart_flush(), uart_putch(), and uart_getch() functions. Sorry, but i don’t undestand; inside these functions there are not setting pins RX and TX of ATmega PORTs. Perhaps it is in header code of some function? The ATmega328P microcontroller UART initiation is in uart_init() function, you should read the datasheet (see the USART part) to understand this uart_init() function. For example in order to enable the ATmega328P TXD (PD0) and RXD (PD1) for UART communication you need to set RXEN0 and TXEN0 in register UCSR0B. Nice project and it works perfectly. Question, can this be modified to include a client that can push data to a server? You need to use the W5100 client (connect) mode instead of server (listen) mode presented in this project. Are there any code samples that demonstrate the use of the connect mode? I am an experienced embedded engineer but the whole ethernet/http thing is new to me. Is there reference material on the web that explains this? 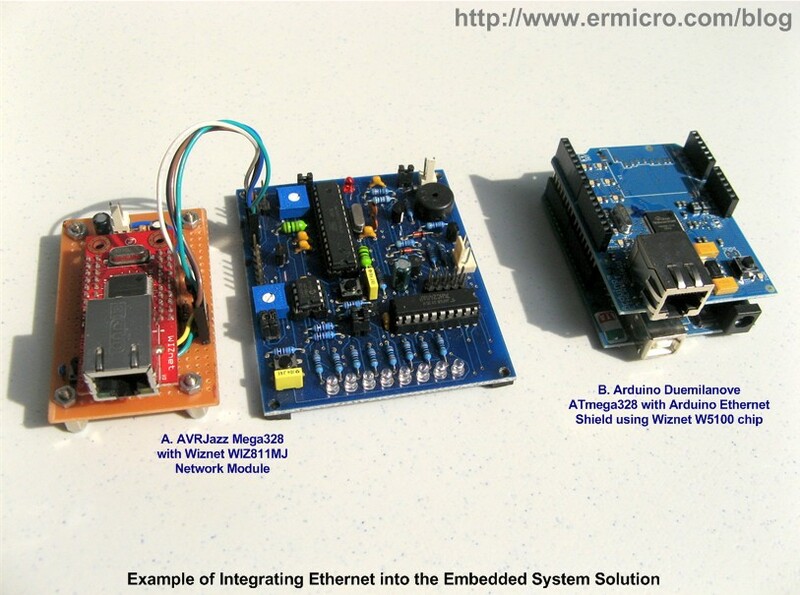 You could study the Wiznet 5100 own AVR library and the Arduino Ethernet Shield Library. I’d like to provide some feedback on this nice application. I wanted to introduce Ethernet to my ATmega640 system. This article has been of great help, but I encountered quite some problems. An ATmega640 has 4 USARTs and I wanted to use USART0 in SPI mode to connect to the W5100. There are some differences between the SPI port and the USARTs. The USARTs have double buffering in their datapath. This means that you want to check on UDRE0 for when you can put the next byte in the data register UDR0. But you have to check TXC0 before manipulating CS! Same problem when receiving; wait for TXC0 and then read UDR0 twice to be certain to obtain the response on the SPIread. It has cost me some time, but in the end I disabled the interrupts for the duration of the SPIwrite and SPIread functions and that solved it. The operation is now solid. The next step for me is to connect a SD-card to the SPI interface and turn this into a small fileserver. However, 2GB maybe small today but it wasn't 5 years ago. Fun! Thanks for posting this excellent article. after having worked on this project I fell in the case described in the comment #3 by jfran, and the solution I’ve found is to increase the buffer size because 512 bytes is enough when using FireFox, but is not enough when using another browser. My code example work fine with all internet browser when using a buffer of 1Kb (#define MAX_BUF 1024). Thanks for this excellent tutorial. I have a doubt. Instead of static IP, how can I run a dhcp client in this tutorial to obtain IP address. You could read the wiznet application note for DHCP implementation from their website (http://www.wiznet.co.kr). This project foresee a local (in house only)connection from client to web-server; can I to connect my IPhone client (i.e. in Los Angeles) to server (i.e. in NY city)connects to router modem dsl by remote connection via internet using mozilla or IE browser ? And, if yes, how to make it? Yes, the same setup as you connect your desktop computer to become a web server. Sorry, but I don’t undestand. Which setup ? Can you explain better, please ? Basicly, first you need the public IP address, i.e. could be called from outside (internet). Next you need to configure your router to route this IP address to your local IP address used by your devices such as your microcontroller small webserver. I have been trying to connect to the server using socket programming in ‘C’. Below is my working scenario. For to achieve this I removed the ‘disconnect ()’ just after the send command and added that just before ‘close ()’ in ‘case SOCK_LAST_ACK:’. Is this the correct way to have a connection till the end of the loop for to send and receive data packets. I’m trying to convert web server program from AVR ATMEGA328 to PIC, but PIC RAM (total 256 byte on gpr banks only) is insufficient and buf[MAX_BUF](512 byte) does’nt work and I can not change PIC. It’s possible to substitute RAM buffer with ROM in order send HTTP message? I think to create a ROM section array of HTTP message pointed by a variable pointer, e.g. * ptr, with the same functions of the RAM variable buf. @arunkumarv31: Is depend on the protocol you used, the C code project above follow the HTTP rules, where every response from the web server is followed by terminating the connection to the web client. @uraian: Logically is possible although I’ve never used EEPROM to store dynamic data (i.e. using EEADR/EEADRH and EEADATA registers) as it not designed for this purpose. I will always choose a similar or higher specification when porting from one type of microcontroller to another, and there should be a very good reason for doing that (e.g. price, availability, and supported development tools). Anyway, my favorite 8-bit 28 pins microcontroller from Microchip is PIC18F25K22 or PIC18F26K22. Currently the project is only for Wiznet W5100 (8-bit data bus, while W5300 is a 16/8-bit data bus) and Atmel AVR Microcontroller, you should check the Wiznet website for information about using the W5300. My card web server doesn’t connect,it does not ping with my PC, adding it doesn’t showed after ipconfig command but only PC is showed. The card and PC are connected to the router linksys WRT54G3G with LAN cable. ADSL modem is not used in this test. May be that setup PC e/or router, TCP/IP port 80 are wrong? The actual setting of PC and router is DHCP mode (IP router and GW: 192.168.1.1,starting IP address 192.168.1.100, subnet 255.255.255.1; static IP web server: 192.168.1.102, GW 192.168.1.1, sub 255.255.255.1, MAC is the same MAC phisical of my PC but last bit modified). You could test using direct connection between the Wiznet and PC with cross UTP cable. Now web-server works fine with browser Firefox and I.E., but it connect only to PC connected wireless to the router, whereas my iphone, in DHCP mode, also connected wireless to router, don’t connect to web-server. Why ? Also, web-server don’t update led status but return always old state when I submit new radio button; parsing C code in debug mode I seen that never parsed radio=0 or radio=1, but it detects fine POST or GET of the string received. If your PC work fine, then the iPhone should work too (although I’ve never try to use the iPhone). Regarding the “radio button”, usually this is because the data is truncated, you need to increase the buf[MAX_BUF] size. I have created an host name in DynDNS.it and I set my router linksys in DNS mode, than I access to router from browser internet. How can I connct by internet from router to web server ? You should check the DynDNS support of how to setup your web server. I Would that web-server be empowered to send e-mail to client in some cases. What C code do I need to add ? You need to implement the email client protocol (SMTP client) to be able to sent email through the SMTP server. It is a great article.Everything is explained very clearly. Thanks for such an article. and web server works fine with PC(OS XP) browser Firefox, IE, and Blackberry browser. Next I have discovered an HTML bug in some browser; when I use Chrome and Iphone (rev. 4 and 5) browser, radio button value, 0 or 1, is not shown in buf register, es. : with Chrome: “buf:…radio=..q.x.o.r..” or with Iphone: “buf: …radio…e..rh…..”, so web server not works. I ask to rwb and to the other interested users if you have already experienced these cases. I tried your code on the Arduino Ethernet board (ATMega328+w5100) with the Arduino IDE, and everything works fine (ping ok, Http ok). Make sure you have #include in your code header. I have the problem with both your examples (cut and paste from the blog web page, so the #include are there). Other statements that are part of stdio.h, are working (ie: sprintf()). I´m trying to do a ping between W5100 and my computer. I use a PIC18F with SPI communication with W5100. My comunication between PIC and W5100 is right: I send and receive the right values. But, when I connect the plug RJ45 is the same as not plug: nothing happens! The lights not turn on, nothing. Read this project “Make Your Own Arduino Shield Cradle“. 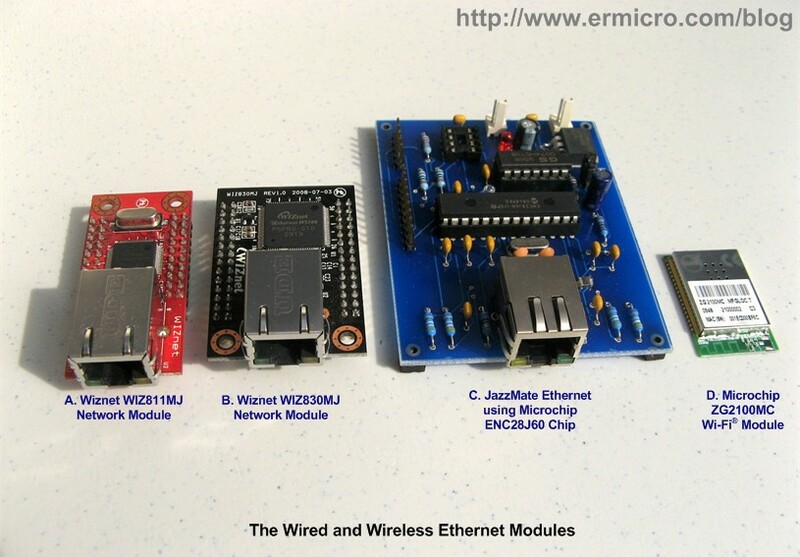 Do you know if there is an equivalent WIZ811MJ network module WIRELESS ? You could check the Microchip ZG2100M/ZG2101M Wi-Fi module which using SPI Interface. Hello, very interesting your post. Im using the wiznet 811MJ and Arduino uno with Atmega328P. I have connected SCLK, MISO, MOSI, SCS, Reset, vcc and gnd of wiznet. Do i need other connection? Hi, first of all thank you. Your post was really useful for me to understand how the W5100 works. I used your code as base for my own project. I’m controlling a board with an Atmel8515 via TCP/IP, and the board send orders to another device via serial. I want to connect to another device too as client. The part where the board opens a socket and listen for connection its done. Now I’m trying to create the connect() function with the W5100 datasheet info and your code but it’s not working. This is my connect() function. Can you help me? //S1_MR, S1_DIPR, S1_DPORT and S1_CR: socket 1 values shown in the datasheet. I had some trouble getting the ping to work with my Arduino Ethernet shield (china knockoff). I had to set the CS for the SD card high, don’t know whether this actually helped or not but doesn’t hurt and added a 500mS delay in main and everything started to work, even a shield I had given up on and threw in the trash. I was trying to connect with w5100 the same way did, but I’m not able to ping it. I was using a Freescale DSP and I configure it to initialize the w5100 module the same as shown above. I’ve make sure that the values on the w5100 registers are right and my SPI communication works. To connect the module to the PC I used a wifi router, using its LAN ports. The router worked perfectly for ping other devices connected to this net but not with the w5100. Do you have any suggestions, or possible steps that I missed to help me out here?